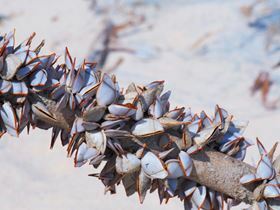 The remarkable properties of natural marine adhesives, such as those used by mussels, have long been studied by researchers. Over millennia, these organisms have harnessed diverse proteins, so that they can grip tightly onto rough surfaces, even in wet, highly dynamic conditions. In recent decades, thanks to a growing understanding of the underlying adhesive mechanisms, scientists have managed to produce a number of robust, sticky, bio-inspired coatings that can successfully work underwater. But now, a group from ShanghaiTech University have taken it a step further – they’ve developed a biofilm that employs a combination of three different biological adhesive systems. Taking inspiration from the principles that make barnacles, mussels and sandcastle worms super-sticky, they’ve created a ‘living glue’ – an adhesive film that makes use of some of the dynamic behaviours of living cells. Writing in Materials Today [DOI: 10.1016/j.mattod.2018.12.039], the team started with a bacterial strain, B. subtilis, which is known for its ability to secrete other proteins. This was genetically engineered it so that it could produce specially-designed ‘fusion proteins’; molecules that combine various strains of the mussel foot protein (Mefp5) involved in adhesion, and TasA, another class of structural protein that can self-assemble into nanofibers. The addition of amino acids like DOPA encouraged crosslinking between the polymers. This formed the basis of their gel-like biofilms, and measurements of the stiffness and shear adhesive strength of the samples showed that one particular biofilm outperformed the others. To further optimise the film’s adhesive properties, the researchers employed a mussel foot peptide (Mfp3S). This had previously been shown to form low surface energy (coacervate) structures – in other words, it enables biofilms to spread, improving their interfacial adhesion. The shear adhesive strength values for this new film were much higher than for the films that did not employ the peptide. They then added exopolysaccharides – sugar residues that are naturally secreted by microorganisms – to the mix. This further improved the adhesive strength of the biolfilm. Barnacles and sandcastle worms undergo several successive processes in order to stick to a surface – the final one is curing. So, for their glue, the Shanghai team turned to metal ions, specifically Fe3+, to act as the curing agent. The resulting “cement-like solid” displayed the highest shear adhesive strength – it was four times higher than that of their initial film. The metal-cured film stuck to aluminium and polyethylene terephthalate (PET) surfaces better than it did to glass. And in the presence of 90% relative humidity and detergents, it maintained its strong adhesion performance. As a final proof-of-principle, the researchers injected the film into crevices on a PDMS substrate. Then, a solution of Fe3+ ions was added, to cure the film in-situ. All of the gaps has been completely filled within 5 minutes, and the final composite maintained its shape and geometry, even after immersion in various acidic and alkaline solutions overnight. By integrating genetic engineering and materials science, the authors have created what they describe as the “first generation of ‘living biofilm glues’”. While they admit that it can’t yet match the performance of other highly-engineered adhesives, they believe that it could open the door to “the further development of smart living glues with previously unattainable functions,” including adhesives that have a regenerative capacity. A new super-strong ‘tough adhesive’ is biocompatible and binds firmly to biological tissues even when they're wet. A team of marine engineers has successfully tested a super lightweight catamaran.